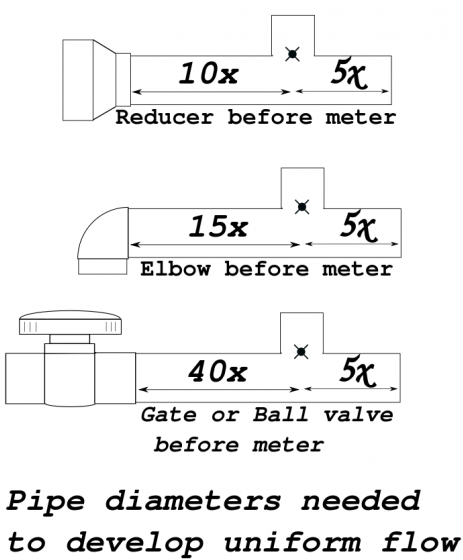 Installation Guidelines for the mounting and Installation of Water Flow meters. This page details mounting and installation guidelines pertaining to paddle wheel flow meters, it will also be a good read for anyone starting out with flow meters in general. These are location and installation guidelines, this is not a troubleshooting guide for mechanical/electrical issues. These guidelines apply to nearly all flow meters, positive displacement meters would be one exception. Having been in the flow measuring business for 30 years, I have found that about 95% of the flow metering issues are traceable back to 3 simple principles. The flow rate must be within the recommended range for the pipe size the meter is installed on. The pipe must be full of water at all times. There must be a sufficient length of straight pipe before and after the meter. All flow meters all have a minimum flow rate they will measure for each pipe size. No flow meter reads down to 0. This lower limit is a result of the flow velocity not containing enough momentum to keep the paddle wheel spinning. At some point the flow velocity drops and the paddle no longer spins linearly with respect to the flow rate. This is the lowest flow rate the meter can accurately measure.Many times the meter will indicated flow rates below this value but will contain a large inaccuracy. At some point the flow velocity becomes too low and the meter will indicate 0, even though there is still flow. Some flow meter manufactures specialize in measuring low flows. These meters work in a clean water laboratory, however, in the real world with dirty water and biological growth these meters do not functioning as advertised. Keep that in mind!! The simple solution is to reduce the pipe size; this increases the speed of the flow which provides the adequate momentum to spin the paddle and also washes away biological growth. The bottom line – if you don’t have an adequate flow rate you need to either reduce the pipe diameter or find a different flow meter. You won’t get satisfactory results trying to monitor flows below the recommended minimum value. The pipe must be completely full of liquid! This is particularly an issue when the meter is installed on pipes that have a downward flow direction. Vertical pipes with a downward flow are the most prone to this issue. Huge flow variations will be noted on the meter if the pipe isn’t full. On horizontal runs with partially filled pipes the results will be either no flow reading if the paddle isn’t in the flow due to the meter being mounted on top of the pipe, or readings that are mysteriously high or erratic. Try to mount the meter in pipes that have upward flows. If this isn’t possible a partially closed valve downstream will restrict the flow and keep the pipe full. Flow meters that sample the flow rate in only part of the cross-sectional area of the pipe rely on the assumption that the flow rate is uniform in the pipe. To develop a uniform flow profile in the pipe, a sufficient straight section of pipe must be both upstream and downstream of the meter. I have experimented with flow straighteners, and found they help but are no substitute for adequate straight pipe. The diagram is a general idea of necessary lengths of pipe needed to develop uniform flow and get accurate results from the flow meter. If an adequate run of straight pipe isn’t possible, a reduction in accuracy may result. Typically the error is uniform(linear) across the flow rate range. So if the flow rate can be determined by some other means, the flow meter can be adjusted to account for the error. On smaller pipes the flow can be run into a tank with a known volume for a period of time. The volume divided by the time will result in the flow rate (gallon/minute). The meter than can be calibrated using this value. The instruction manual contains an example detailing this scenario. One of the most asked questions I get “I don’t have enough straight run of pipe, how inaccurate will the meter be? ?” This question is impossible to answer. There are just too many variables effecting the flow profile in the pipe. Mounting locations with a lack of straight run pipe will still give good repeatability, it’s the accuracy that might be poor. Many meters are only used to monitor flow and look for daily or weekly changes in flow rates. In these cases the accuracy isn’t as important but repeatability is. These flow meters are relatively simple devices and if the above installation guidelines are followed they should function as advertised. If you are having trouble I would like to hear from you. I have been helping people successfully install these meters for 30 years and I want you to be happy with your meter.